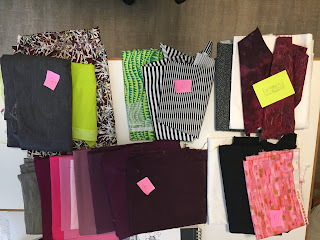 I headed to the beach for a retreat in January 2019, and didn't have any projects in the works to take along. What? No UFO's? Great! However, that meant I had to scramble to put together a couple of ideas for a project. I decided to get 2 quilts from the charity group that needed binding; and to make a quilt from the leftover fabric from my Nancy Crow class taken 2 years ago. I had tons of burgundy family fabrics, a lot of black and white and grays, and a few pops of color to go with it all. I had no idea where I was going with this quilt, and that was part of the fun. 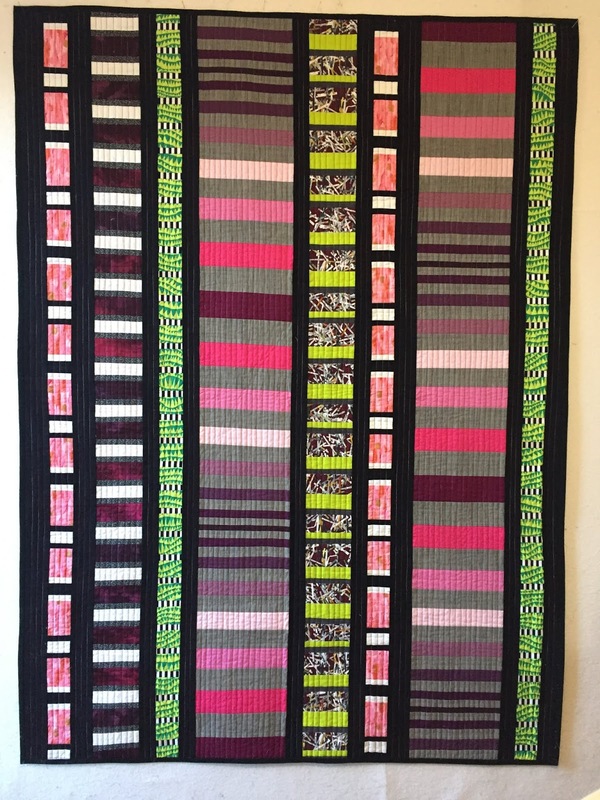 I sewed 5 different strip sets. And, I forgot to take pictures of them. I hope you can figure out what they were from the picture. These were cut into varying widths and sewn together with black setting strips. 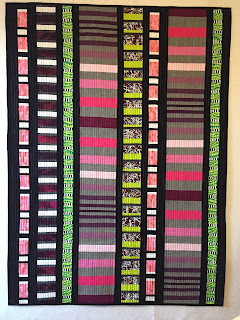 I decided to quilt it with a heavy variegated thread with a walking foot. It was fun to make and used up a lot of fabric that has been sitting in my stash. Two good things! Here is the completed quilt. It is 48" x 64".